So this month marks 5 months I’ve been doing this blog and I haven’t done any personal things. You guys don’t know much about me. So I decided to do the Get To Know Me Tag. There are a few different versions of this floating around the internet along with a few different versions of the About Me Tag but I didn’t particularly like all the questions on any of them so I decided to take some of the questions from the different ones I found and then made up a few of my own. I ended up with 45 questions… I got a little carried away. 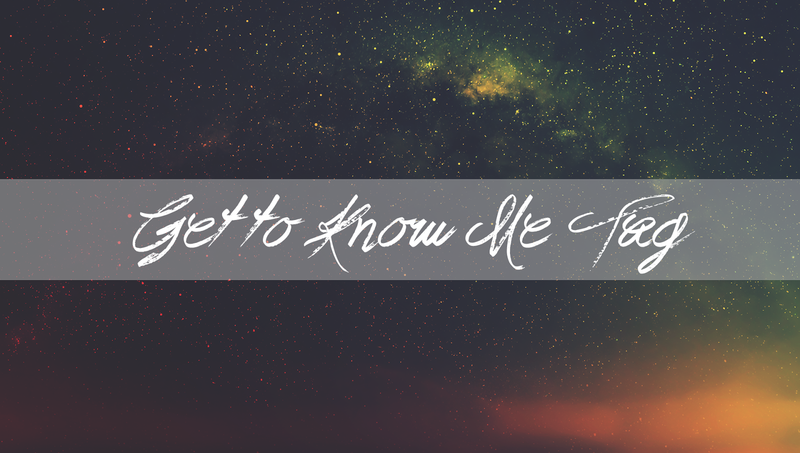 I took some of the basic profile info questions, some of the basic favorites, some of the questions from the Get to Know Me, About Me and the TMI tags, and came up with some myself. This that is more like an About Me TMI Tag. My sister calls me Ada which is short for my middle name Adaline. I don’t really have any other nicknames. Brown. From far away anyway. Up close they are weird. They are more of a golden color with green streaks. Naturally my hair is a medium shade of brown. Though I have been dyeing it reddish auburn for 2 years. Not yet. I’m going to get my first on my birthday. My Nose, my earlobes, and on piercing on the cartilage of my right ear. I wanted to get my eyebrow done a few years ago but my mom wouldn’t let me and now I glad because I would have taken it out by now and left with a weird mark. 12.) Left or Right Handed? Left. Both of my parents are left handed too. 13.) Top 5 Favorite Bands? 15.) Top 5 Favorite Songs At The Moment? 16.) Last Song You Listened To? 19.) Last Book You Read? Yes! I love them! My favorite podcast is Psychobabble with Tyler Oakley and Korey Kuhl. I also love Not To Deep with Grace Helbig. And I love Ear Biscuits with Rhett and Link. Actually those are the only 3 I listen too. No. It might be weird that I like podcast and not audio books but I just can’t pay attention. I catch myself zoning out when listening to podcasts. With a podcast I can rewind and it will make sense. If I zone out with a book I have to restart the chapter. 22.) Top 5 TV Shows? I tend to like movies of a series. If I can’t choose a favorite from the series I’ll just list the series. 24.) Top 5 Favorite YouTubers? These are my Favorites at the moment. In No Particular Order. - Dan & Phil - Dan and Phil Games to be more exact. There are so many colors. How do I pick one? I don’t really have a favorite color. I just love so many. I really love color combinations too. Like the mint green and coral pink color theme of my blog. And I love neon/hot pink and neon orange. My top fave single colors are Tardis Blue, classic red, Vibrant Deep Purple, black, and white. My favorite video game is Probably The Last of Us. The story is so amazing and the characters are so much more developed than they are in most video games. The graphics are amazing and game play is really fun. It’s not a game for people who don’t like a lot of story. There are a lot of cut scenes. Personally I loved the story and loved that I got to be a part of it. I truly felt for the characters and thought the story was really well written. I also really loved Outlast. There isn’t as much story but it was an awesome game. The horror wasn’t based only on jump scares. I mean there were a lot of them but the game is also so tense and crazy the jump scares are only part of the horror. I loved the story and the bad guys who come for you. The Map was huge for a horror game. I really loved it. I also really loved the Walking Dead Game series! I love the show and the comics and I love that that the game is drawn like the comics. And I love the story of the games. I love Clem so much now! I love the game play style. I love that the game adapts to your choices and that you can pick what Lee and Clem say. Lee being you play as for season 1 and Clem who you play as for season 2 and who you will play as for season 3. Which I can wait for! The story of both seasons has been amazing and I can’t wait to see the story for season 3! I love owls. I don't know why. I also love cats. I love Halloween! But I also love Christmas! Can we just say it's tie? Ok Maybe I love Christmas just a little more but not much. That’s a hard one. My favorite type of food is probably Italian. I love pasta. You can make so many dishes with it. As for favorite food I’m not sure I could pick one. 31.) Favorite Candy or Sweet Treat? I love cherry flavor hard candy. And I love Blueberry Muffins. Ulta, Sephora or any electronic section with computers and video games. I hate it when people pull out in front of you just to turn into the next parking lot. Like WTF? Especially if there was no one behind me. I hate when people mispronounce words. I hate when people have a different opinion than yours and they have to tell you. Not always in a polite way. And the state it like it’s a fact. It's get that you have an opinion but you don't have to fight with someone of their opinion is different than your's. Mac. I’m all apple. All the apple electronics. Except the Apple Watch. I don’t get the hype around it. And I hate wearing watches. 35.) Summer, Winter, Spring or Autumn? Autumn. Falling Leaves, it’s chilly but not too cold. I’m not a big fan of really hot weather. It’s easier to warm up than to cool off. Autumn is just so beautiful and snuggly and I can wear pants and long sleeves but not double layers. I just love Autumn! Plus Halloween man! Coke, except out of a can. All pop is terrible out of a can. I don’t drink anything out of a can. 38.) Starbucks or Dunkin’ Donuts? Drink Order? Starbuck for drinks, Dunkin’ for donuts. 39.) Breakfast Lunch or Dinner? Lunch or dinner. I hate most breakfast food. I like eggs but these must have garlic and onion powder in and I like waffles but I have to have a taste for them. 40.) What’s Your Taco Bell Order? I get to soft tacos with just meat, a cheesy fiesta potatoes with the sour cream and cheese on the side and then dip the tacos in the cheese and sour cream. It like a crunch wrap without the lettuce and tomatoes and it’s like 2 dollars less. I taught myself how to play the guitar, acoustic and electric. I also taught myself the piano and the drums. I can learn how to play any instrument that isn’t a wind instrument. Yes. My mom taught me how to swim in the bath tub at 18 months old. I love to swim. 44.) Somewhere you want to visit? I would love to visit every state in the USA I have most of the east coast covered. I’d also love to go to England and other parts of the UK. Japan sounds awesome. And I’ve wanted to go to Australia since I was a kid and watched The Crocodile Hunter every day. I’d just really love to have a stepped foot on all 7 continents before I die… Well 6 of them I’m not sure about Antarctica. 45.) A Quote You Live By? So that was the get to know me tag. You probably learned more about me than you wanted too. Sorry about that. I hope you still want to stick around with me. In the comments let me know your Favorite Bands/Artists and your Top 5 favorite songs at the moment. I’ll leave a copy of the questions in the comments. Feel free to do this tag or do a smaller version. Photo Credit: Background image from pexels.com and edited by me. 15.) Top 5 Favorites At The Moment?